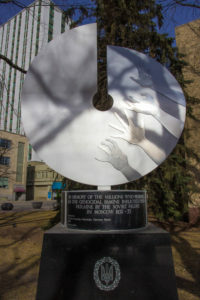 The first public monument to the Holodomor was erected and dedicated outside City Hall in Edmonton to mark the 50th anniversary of the Soviet-inflicted famine-genocide. The public unveiling in 1983 by then Mayor Laurence Decore boldly proclaimed the existence of the event and spoke of the city’s connection to its Ukrainian community – a large portion of Alberta’s population. Ludmilla Temertey’s sculpture symbolizes the scar on humanity left by authoritarian political regimes, and more specifically on the Ukrainian people by Josef Stalin. Commissioned by the Canadian Ukrainian Committee, the monument commemorates the lives lost and acknowledges a little-known and poorly understood event in world history. The genocidal famine was enacted to punish farmers for resisting the collectivization of agricultural production. The death of the greatest number of civilians during peacetime occurred when food, livestock and seed grain were removed from the country and the borders were sealed. Following the forced famine of millions of people, the Russification of Ukraine saw the extermination of religious, academic, and cultural leaders. Until the fall of the Soviet Union in the 1990s, any record of the genocide was suppressed and those who spoke of it were silenced by the Soviet government. The sculpture invites examination of the histories constructed by Soviet Russia and allows members of the larger community to show solidarity against injustices committed against humankind. An inscription on the base of the artwork reads: “Let us all stand on guard against tyranny, violence and inhumanity”. Biography: Ludmilla Temertey is a graphic designer and artist who lives in Montalcino, Italy. She was born “in a haystack” while her family was fleeing from Ukraine in a caravan after losing their land to Stalin’s collective farms. Though her parents spoke little of the horrors they had endured, Temertey later learned that her grandfather was executed after being labeled an agitator for refusing to give up his farm.